There are many things about Columbus that many folks out on the coasts do not know. For one thing, it rules! It’s also relatively (or extremely, depending on where you’re at) cheap to live in. Funny how that happens when you don’t insist on planting your stakes next to an ocean. Anyway, let’s talk about our special co-hosts for this week’s episode. ALSO (“There’s More! ?” – You), Tyler sits down with an enterprising young pedicab driver named Zach, who imparts wisdom from years of pulling Columbus’ drunkest and/or most enthusiastic tourists and/or OSU fans all over the roads of Short North, the Arena District, and anywhere else there’s a calling. 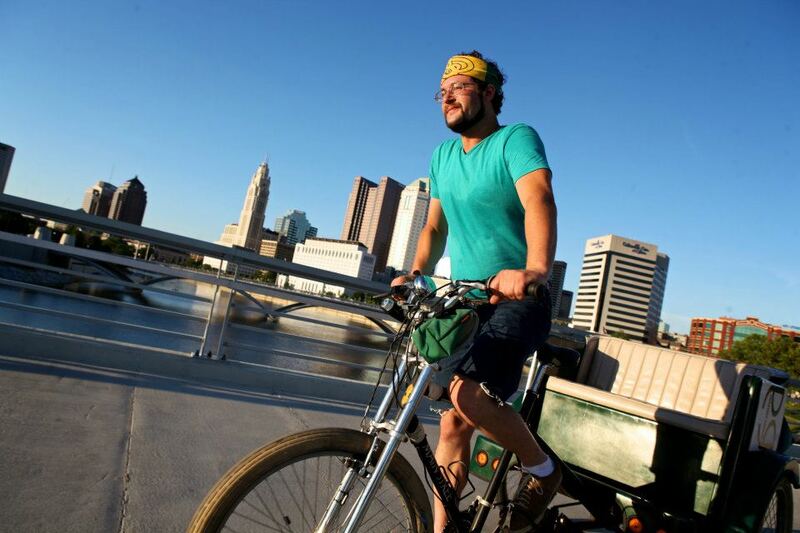 If you’ve ever wondered what the life of a pedicab driver is like, wonder no more! Enjoy! So, if you’re ever traipsing through the Midwest, don’t miss this town. Try some Jeni’s Ice Cream, have a few drinks at the Surly Girl, Bodega, or any other one of their dozens of great pubs, and scarf down a Late Night Slice before heading home. When you wake up, get to Skillet early to eat one of the best breakfasts you’ll ever have. And go Crew! And Jackets! And Clippers (AAA)! Rock n ‘ Roll.